Poor Jack. The voice recognition software built into our Rosetta Stone Spanish program is designed for adult voices. He sits at the computer, his head engulfed by gigantic headphones, and tries to communicate with the program. “El nino esta infermo,” he says. “Dee-doo”: the sound of failure from Rosetta Stone. “El nino esta infermo,” he repeats more firmly. Dee-doo. I’m a huge fan of the Rosetta Stone model. Everything in the program is in Spanish, so a native Japanese or Swedish speaker would see the exact same exercises that we do. And for now, that works. It’s pretty easy to illustrate basic Spanish in photographs: “The eggs are blue.” “The men drink coffee.” “Who is washing the socks?” But I am intrigued to see what happens when we move out of the descriptive present and into the more complex concepts of future conditionals or past perfect progressive. 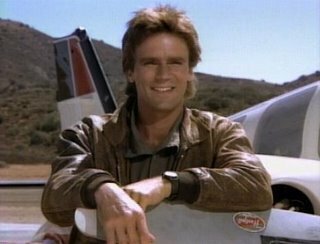 And the thing that this software doesn’t help with is what I call MacGyver Spanish. In the 1980s, there was a (probably horrible yet popular) television show featuring a secret agent who found himself embroiled in death-defying situations each week, usually with nothing but a stick of gum and a paper clip to craft a resolution to the bomb that was about to go off. I watched it religiously as a child, and now am trying to bring his philosophy to a foreign language: how do you craft a comprehensible sentence out of the materials you have at hand? For me, at this point, it’s a lot of people categories (brother, grandmother, spouse), some numbers, a handful of question words and some basic present tense verbs. I would add gestures to the toolkit, of course. So when faced with the need to say “chalkboard” (as if that would ever come up, but work with me…), I clearly have no idea of the actual word in Spanish. But I can say, “In school, the teacher writes. It is black with… it is white.” Combined with miming writing on a wall, I’m pretty sure most people would get my point. But my children don’t get it at all. When I force them to say something in Spanish, they start the sentence — “It is…” — and then crash into an unknown word and stop. I’ve tried explaining that they can talk around the missing word, to find some words that they do know and use those. Retta is beginning to understand. She couldn’t remember “brother” the other day so she came up with “the boy your son.” But Jack just throws himself figuratively on the ground in front of the unknown word and gives up. Luckily, Rosetta Stone seems to have a pretty good sense of the basic tools I need — the stick of gum and paper clip, if you will. Need, want, can. Leave, come. Time, days, months. No fourteen-option-list for how to say something is great, awesome, wonderful, special. Muy bien works fine for all of those, when I’m defusing a metaphorical bomb which is my life in a foreign country!